Easy Questions. Tough Questions – is there a difference? One thing guaranteed when you sit across from an interviewer in a job interview is that you’re going to be asked questions. Questions about your knowledge, skills, experience, strengths and weaknesses, suitability for the role etc. The list goes on. You will be asked questions – guaranteed. This is more often than not the greatest cause for concern, for us as interviewees, and makes each of us nervous. We wonder what they are going to ask us? Is it going to be an easy question or a tricky one? We’re on edge. The reason for this is that we lack control. We lack control of what the interviewer is going to ask us. And we don’t like it! We have to accept that we have no control over what the interviewer is going to ask us. However, we do have control over our mindset and how we prepare. A ‘tough’ question for one interviewee will be easy for another. Why, because it’s how we think about questions that matter. If you think they are likely to be tough then they probably will be tough. If you think they’re ok or easy then you’ll be right too. So a tough question is only a tough question because you think it is. Yes it’s how you think about it that matters. And you can help how your mind thinks about it, by preparing in advance. There are only so many ways that someone can ask you about yourself, your knowledge and experiences. They may use different phrases or words, but at the end of the day, they are still asking questions about you. Most interviewers follow a similar pattern and similar questions, so there’s a good chance that you can be well prepared for any questions posed. Get yourself a notebook or preferably use your computer to record a list of typical interview questions. You can then add and update as you go along to ensure that you have the most detailed and relevant answers for each question. This will help you be prepared for any interview you have, now and in the future. As you write you answers, keep it factual, descriptive and to the point. Questions like these are designed to get to the core of who you are as a person and for the interviewer to try and understand quickly whether you’re the right person for the role. In advance think about what your own particular strengths and weaknesses are. Strengths might include good at building relationships, presenting, problem solving, attention to detail, focus, managing teams or projects. Weaknesses might include presenting, perfectionism, taking on too much etc. Make a list of them and then find three examples that highlight each of those strengths/weaknesses to back up what you’ve said. For each weakness write down what you’re doing to overcome or manage it. 3. Why should I choose you for the role? This is your chance to highlight why you are the best person for this job. Review the job description and identify the key skills they are seeking and link your skills, knowledge and experience to those elements. Also think about is there anything unique to you that would benefit the organisation that will help you stand out? 4. Tell me about a time when something went wrong? – How it was rectified? – What you learnt from it? 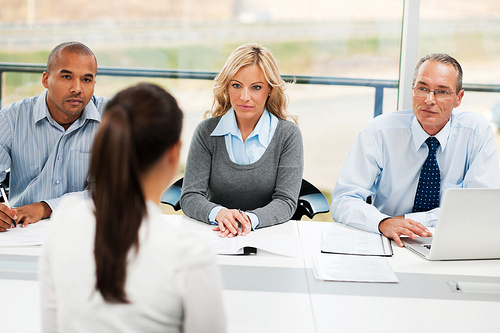 Remember an interviewer wants to know what you’ve learnt from the experience. Make a list of the qualities that you like about the organisation and the role e.g. Market leading products and services, culture, management, interesting market they operate in, career growth and opportunities, organisational reputation, clients etc. Answers to this question should flow easily. If it seems too hard, they I’d suggest you probably shouldn’t be applying for the role. Most of the time spent in interviews is answering questions, so much of your preparation needs to be focused on thinking about the answers you need to give and getting across the key information about you. Make answers personal, relevant and to the point. Do this and you’ll stand out in the interview crowd!